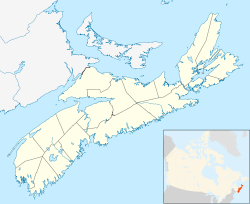 Truro (Mi'kmaq: Wagobagitik) is a town in central Nova Scotia, Canada. Truro is the shire town of Colchester County and is located on the south side of the Salmon River floodplain, close to the river's mouth at the eastern end of Cobequid Bay. The area has been home to the Mi'kmaq people for several centuries. The Mi'kmaq name for the Truro area, "Wagobagitik" means "end of the water's flow". Mi'kmaq people continue to live in the area at the Millbrook and Truro reserves of the Millbrook – We’kopekwitk band. Acadian settlers came to this area in the early 1700s. The Mi'kmaq name for the Truro area was shortened by the settlers to "Cobequid", and the bay to the west of the town is still named Cobequid Bay. By 1727, the settlers had established a small village near the present downtown site of Truro known as "Vil Bois Brule" (Village in the burnt wood). Many Acadians in this region left in the Acadian Exodus which preceded the Expulsion of the Acadians in 1755. In 1761, the British settled the area with Presbyterians of predominantly Ulster Scottish origin who came from Ireland via New England. They named the new settlement after the city of Truro in Cornwall, United Kingdom. Originally a small farming community, the construction of the Nova Scotia Railway between Halifax, and Pictou in 1858 caused the municipality to experience a fast rate of growth which increased even more when the railway connected to central Canada in 1872 and became the Intercolonial Railway. The Intercolonial, which later became the Canadian National Railway built a large roundhouse and rail yard in Truro. Further rail links to Cape Breton and to the Annapolis Valley through the Dominion Atlantic Railway in 1905 increased the town's importance as a transportation hub for Nova Scotia. The railway also attracted industries such as the Truro Woolen Mills in 1870 (which later became Stanfield's) and provincial institutions like the provincial Normal School (later the Nova Scotia Teachers College) and the Nova Scotia Agricultural College. The town officially incorporated in 1875. Many figures from the town's past are featured in over 40 tree sculptures which were carved in tree trunks after Truro lost most of its Elm trees to Dutch Elm Disease in the 1990s. The history of the town and surrounding county is preserved at the Colchester Historical Museum (c.1900-1901), which is designated under the provincial Heritage Property Act. Truro railyards at the junction of the CN & CB&CNSR lines, 2006. Truro is known as the Hub of Nova Scotia as it is located at the junction between the Canadian National Railway, running between Halifax and Montreal, and the Cape Breton and Central Nova Scotia Railway, running between Truro and Sydney. Until the 1980s, Truro also hosted a junction between the Canadian National and Canadian Pacific Railway's former Dominion Atlantic Railway line running through Windsor and down the Annapolis Valley to Yarmouth, Nova Scotia. An important highway interchange is located just north of Truro in the rural community of Onslow where Highway 102 ends at Highway 104 - both four lane expressways. Secondary roads Trunk 2 and Trunk 4 intersect in the town. Important tertiary roads Route 236 and Route 311 end in the nearby communities of Lower Truro and Onslow respectively. Some of these roads also form part of the Glooscap Trail which is a scenic drive for tourists. Truro railway station is served by Via Rail's Ocean line. Nova Scotia Power has several transmission line corridors in or near Truro; additionally Bell Aliant, EastLink and 360networks route most of the major telephone and data communications lines in the province through the town. Six large sections of the Berlin Wall are located along the Cobequid Trail, on the Agricultural Campus of Dalhousie University. Truro has two public high schools, Cobequid Educational Centre and the francophone École acadienne de Truro. Post-secondary options include a campus of the Nova Scotia Community College, and The Institute of Human Services Education, as well as the Agricultural Campus of Dalhousie University in the neighboring village of Bible Hill. Truro has three ice hockey rinks: Deuvilles Rink, Rath Eastlink Community Centre, and the Colchester Legion Stadium. Truro is home to the Truro Bearcats, a Junior "A" ice hockey team who are four time MJAHL Champions. (Canadian) Football is also a popular sport in the town with all games being played on Friday night at the Truro Amateur Athletic Club (TAAC) grounds. Truro Raceway conducts harness races every Sunday. Truro is also home to a rugby club, which hosts the World Indoor Sevens Rugby Championships. Truro also has a senior baseball team, the Truro Senior Bearcats, that play in the Nova Scotia Senior Baseball League. Their home field is at the Truro Amateur Athletic Club (TAAC). Lacrosse has become a very popular sport in Truro over the recent years. There is a minor lacrosse association, the Truro Bearcats Lacrosse Association, which allows youth to take part in organized lacrosse teams and games. As well, there is a junior A lacrosse team, the Mi'Kmaq Warriors, that plays in the East Coast Junior Lacrosse League. They play in the summer months out of the Colchester Legion Stadium. Truro enjoys a vibrant soccer scene centered about the local "CC Riders" soccer club which serves "Tier 2" soccer for both genders and all ages. Outdoor soccer takes place between May and October and indoor 7-a-side and pickup games run through the winter months. Finally, there is also curling, bowling, swimming, softball, baseball, tennis, golfing, martial arts, snowboarding, snowshoeing, basketball, volleyball, skiing and most everything else either at school and/or local club level. Glenn V. Davidson, Retired Naval Officer. Recipient of an Honorary Doctorate of Civil Laws from University Kings College. Doug Rogers, Olympian and flag bearer for Canada at the 1972 Olympics. Truro has a humid continental climate (Köppen climate classification dfb) similar to the vast majority of The Maritimes. The highest temperature ever recorded in Truro was 35.6 °C (96 °F) on 19 August 1935 and 15 August 1944. The coldest temperature ever recorded was −38.3 °C (−37 °F) on 22 January 1934. In the 2016 Census of Population conducted by Statistics Canada, the Town of Truro recorded a population of 12,261 living in 6,052 of its 6,574 total private dwellings, a change of 1.7% from its 2011 population of 12,059. With a land area of 34.49 km2 (13.32 sq mi), it had a population density of 355.494355.5/km2 (920.726920.7/sq mi) in 2016. Central Nova Tourist Association — Tourism association representing Cumberland County and Colchester County, including Truro. Davis, Stephen A. (1997). Mi'kmaq. Halifax, Nova Scotia: Nimbus Publishing Limited. ISBN 1551091801. ^ Davis 1997, p. 71. ^ "Mi'kmaw Bands in Nova Scotia". Cape Breton University. Retrieved August 21, 2017. ^ Colchester Historical Museum. Canadian Register of Historic Places. Retrieved November 17, 2010. ^ "August 1935". Canadian Climate Data. Environment Canada. Retrieved 20 March 2016. ^ "August 1944". Canadian Climate Data. Environment Canada. Retrieved 20 March 2016. ^ "January 1934". Canadian Climate Data. Environment Canada. Retrieved 20 March 2016. ^ "Truro, Nova Scotia". Canadian Climate Normals 1981–2010. Environment Canada. Retrieved 12 April 2015. ^ "Truro". Canadian Climate Data. Environment Canada. Retrieved 27 June 2016. ^ "Truro NSAC". Canadian Climate Data. Environment Canada. Retrieved 27 June 2016. ^ "Daily Data Report for September 2010". Canadian Climate Data. Environment Canada. Retrieved 27 June 2016. ^ Climate data was recorded at Truro from January 1873 to August 1915, at Truro NSAC from January 1910 to April 2005 and at Debert from December 2003 to present.